Documentation and SupportReleases Mango Release Notes 2016-11-12Hive Export Connector Now Available. 3. 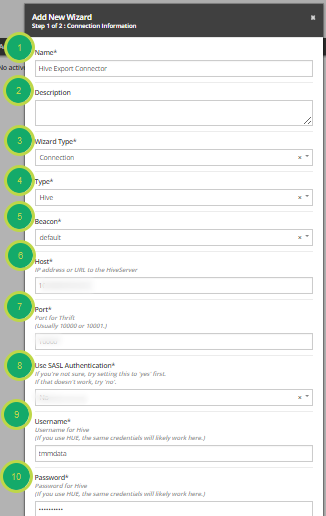 Fill out the 'Run New Wizard' modal. Name: Name of this Connector. Description: An explanation of the Connector. Beacon: Beacon to use with the Connector. Host: IP address or URL to the HiveServer. Use SASL Authentication: If you are unsure, select 'Yes' first. Username: User name for Hive. 4. If successful you will receive a confirmation message. 5. 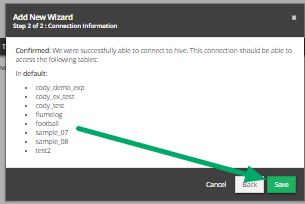 Congratulations, you have successfully created a Hive Export Connector. 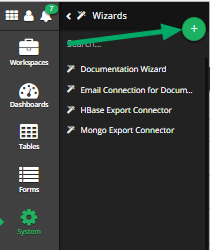 Prev: HBase Export Connector Now Available. Next: OneDrive Export Connector Now Available.